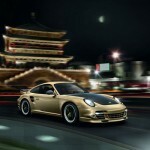 Back in 2001, Porsche has entered the Chinese market, and now, to celebrate its 10th anniversary, the German car makers has announced a Special Edition Limited Porsche Turbo S. The Porsche 911 Turbo S 10 Year Anniversary Edition will be distinguished by a Gold Bronze Metallic exterior paint job with contrasting accents in matte carbon and high-gloss black on the 19″ Sport Classic wheels. The car’s aerodynamics will be improved by an Aerokit front spoiler, front lid, and black matte carbon fiber exterior mirrors. 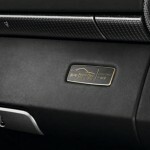 The black matte carbon fiber can also be seen on the upper part of the rear spoiler. Based on the Turbo S, Anniversary Edition is powered by a 3.8-liter Boxer engine developing 530 bhp, coupled with the Porsche Doppelkupplung (PDK) as standard. 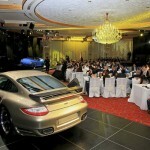 Open thе door to discover an elegant interior that is a clear tribute to thе motorsport heritage of Porsche. 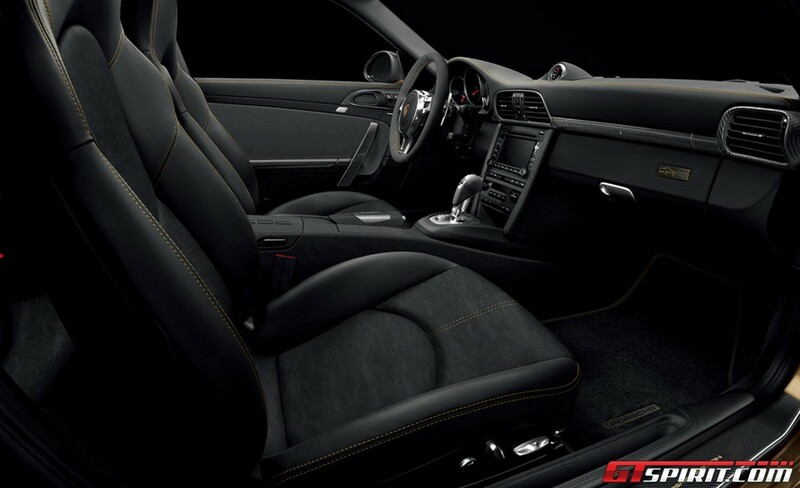 Black smooth leathеr is accompanied by carbon accents and alcantara, while thе leathеr deviating stitching in gold provides strong visual interest and mirrors thе exterior tones. 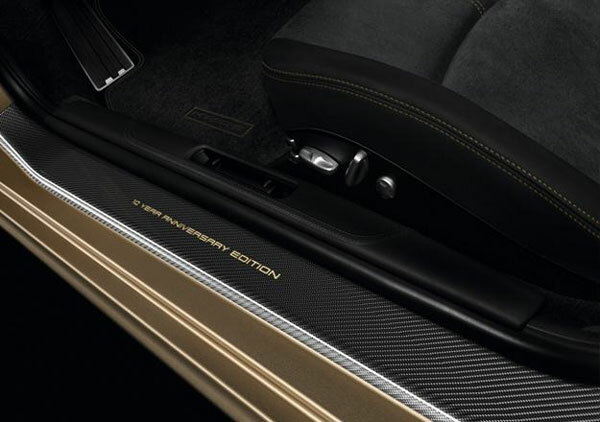 Subtle details such as thе laser-etched carbon door entry guards with gold tone “10 Year Anniversary Edition” lettering, and black instrument dials with a golden silhouette of thе special edition complete thе look. 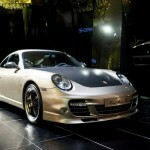 The Porsche 911 series is well recognized as the most iconic Porsche model line. 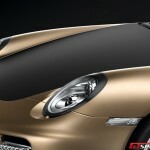 Beyond greeting the 10th birthday of Porsche in China, an important milestone in Porsche history, the Porsche 911 ‘10 Year Anniversary Edition’ is another endorsement to commemorate 25 years of Porsche Exclusive creations, all offering the highest level of personalization service, said Helmut Broeker, Chief Executive Officer of Porsche China. 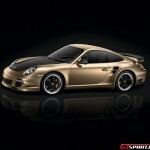 There will only be 10 units produced, each priced at $540,000. 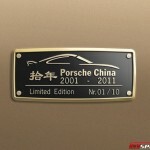 Owners of the 911 10 Year Anniversary Edition will also receive a replica sculpture with each owner’s name personally engraved on the base plate. Sales will begin from next month. 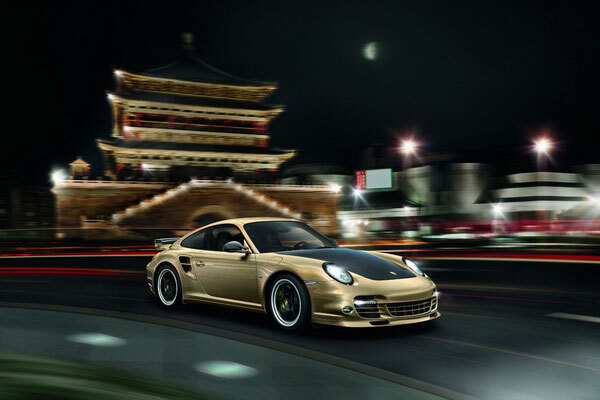 In addition to the 911 Turbo S 10 Year Anniversary model, Porsche will also be opening three new Centers in Taizhou, Zhengzhou, Haikou and Chengdu Airport. * Weight is calculated in accordance with the relevant EC Directives and is valid for vehicles with standard specification only. Optional equipment increases this figure. The figure given includes 68 kg for the driver and 7 kg for luggage. 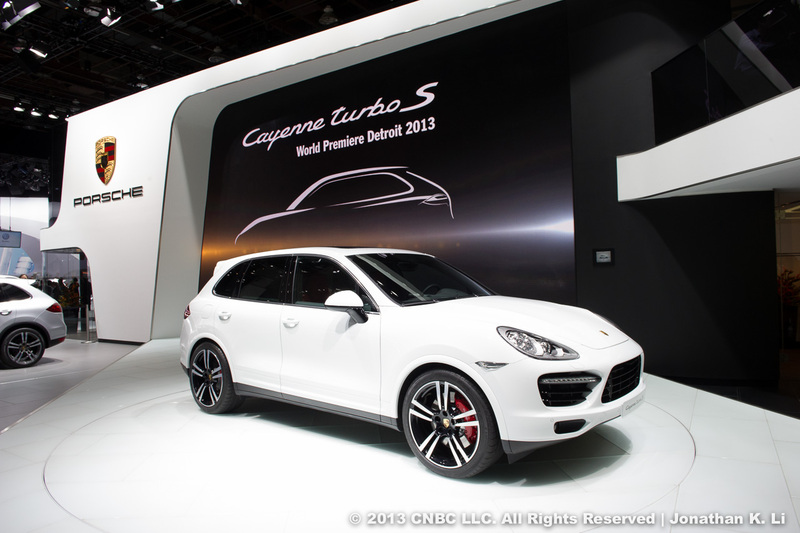 ** Figures for PDK with optional Sport Chrono Package Turbo and SPORT PLUS button selected. *** Data determined in the NEDC (New European Driving Cycle) in accordance with the Euro 5 (715/2007/EC and 692/2008/EC) measurement method. The figures do not refer to an individual vehicle nor do they constitute part of the offer. They are intended solely as a means of comparing different types of vehicle. 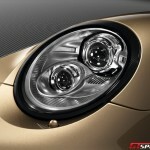 You can obtain further information about individual vehicles from your Porsche Centre. Fuel consumption calculated for vehicles with standard specification only. Actual consumption and performance may vary with items of optional equipment.